February 2012 newsletter - Waterproof Materials. Does your project call for waterproof labels, tags or wristbands? Do you have a great idea for your next project but not sure where to beginor what materials to choose? Don’t drown trying to make these decisions! In fact we can waterproof and customize just about anything you can put in water. We have over 200 waterproof materials we can easily customize for your next project requiring waterproof labels, tags or wristbands. 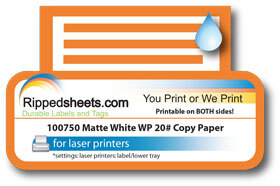 Back in the 1990s Rippesheets.com became the leader in modern pressure sensitive labels by developing waterproof labels that dry plastic toners would adhere to. In fact, we became the experts on online waterproof labels by working on dozens of projects proposed by our prospective customers. Through a little fine tuning and lots of experimenting, we were able to develop hundreds of waterproof materials.